Botanical Name for Fumitory: Fumaria officinalis. One of the plant’s English common name “earth smoke” is a direct translation of the old Latin name of the plant, “fumes terrae”. It refers to the shape and color the plant’s gray-blue haze foliage which can from afar resemble smoke rising from the ground. Other Common Names: Common fumitory, drug fumitory, hedge fumitory, earth smoke, wax dolls, fumaria (Spanish), reykjurt (Icelandic), Gewöhnlicher Erdrauch (German), fumeterre officinal (French), jordrøyk (Norwegian), jordrök (Swedish), jordrøg (Danish), peltoemäkki (Finnish). Habitat: Fumitory is originally native to Europe and North Africa, but has been introduced to Asia, North America, and Australia. Description: Fumitory is a 10-50 cm tall, annual herbaceous plant that is usually classified in the poppy family (Papaveraceae) but has sometimes been placed in a plant family of its own (Fumariaceae). The plant has smooth, thin and soft stems with gray-blue leaves. The flowers are purple-pink and bloom from April to October in the northern hemisphere. The fruits are spherical nuts (achenes). Plant Parts Used: The entire plant, except the root, has been used in herbal medicine. The plant material is collected at the beginning of the flowering period and dried for later use in extracts, teas, pills (capsules), eye lotions and tinctures. The herb has a bitter and salty taste, and the plant juice has a strong distinctive smell. 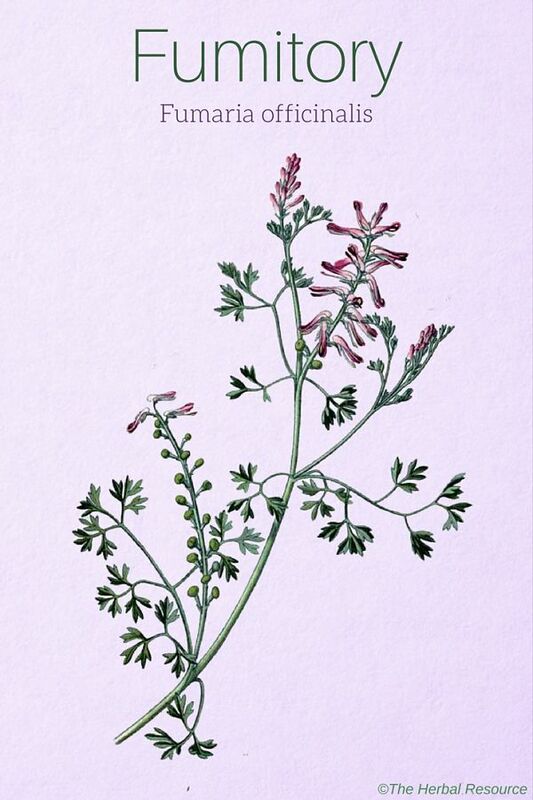 Active Ingredients and Substances: Fumitory contains few toxic alkaloids, fumaric acid, flavonoids, chlorogenic and caffeic acid, bitters, tannins, mucilage, amino acids, and resins. 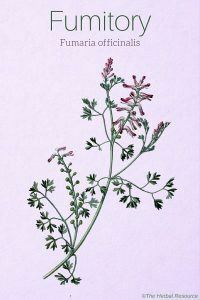 Fumitory is a plant that has followed humans as a weed in fields and gardens for centuries. The herb has been used as an herbal medicine since times of the Roman Empire or even before that and from the Middle Ages to the 18th century it played a prominent part in traditional herbal medicine. The Greek physician and pharmacologist Pedanius Dioscorides (40 – 90 AD) mentions the herb in his “De Materia Medica”, an important document on botany and pharmaceuticals and Pliny the Elder (23-79 AD) wrote in his last work “Naturalis Historia” that rubbing the eyes with the sap or latex of fumitory produces tears in the same manner as acrid smoke. In herbal medicinal literature from the 1400th and 1500th century the herb was recommended for arthritis, liver and spleen disorders and wound and rash healing. Both Nicholas Culpepper (1616-1654), an English botanist and herbalist and Maud Grieve (1858-1941), also an English herbalist, valued it highly for serious conditions such as liver disease and leprosy. It was also used in folk medicine as a treatment for jaundice and as an allopathic medicine. In ancient times, fumitory was regarded to have magical powers. The plant was burned in bonfires because it was believed that the smoke from the plant could protect against witchcraft and expel evil spirits. According to an ancient legend, the plant first come to be, not from a seed, but from a vaporous smoke rising from the earth. Fumitory is not used to great extent in modern day herbal medicine but it still has some medicinal applications. The herb is regarded to have diaphoretic (sweat-inducing), diuretic and blood purifying properties. Animal studies support some of the traditional use in humans and have shown that the herb may have a certain blood pressure lowering, slight diuretic, and laxative effect. The herb is used as a tonic to increase appetite, and it is believed to stimulate the smooth muscles of the intestines and thus strengthen peristalsis. It is also used as a tea as an herbal remedy for intestinal parasites. In addition, the herb is thought to promote the function of both the liver and the gallbladder and have an antispasmodic effect on the valve which opens and closes off the bile flow to the duodenum, thus normalizing the bile flow. Therefore, it is sometimes used internally as a remedy for biliary colic (pain due to a gallstone temporarily blocking the bile duct) and migraine associated with digestive problems. In Germany, fumitory is approved for the treatment of biliary colic. 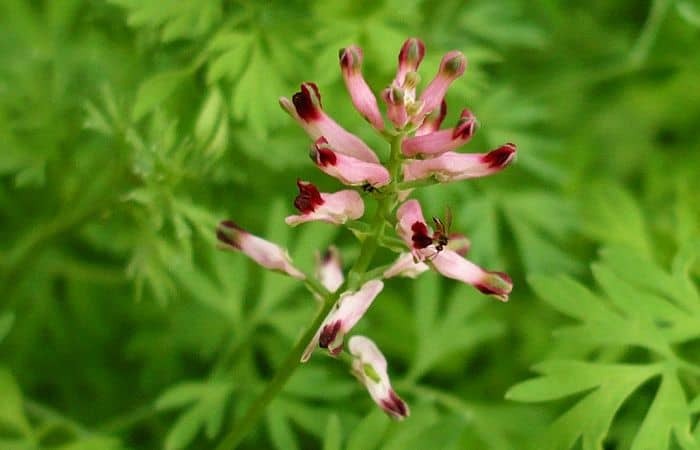 Fumitory has for a long time been used to treat skin ailments such as rash, chronic eczema, psoriasis, scabies and acne. These uses may be due to the alleged purifying and detoxifying effect the herb is believed to have on the kidneys and liver, but it may also be due to the content of the fumaric acid. Traditionally, the herb has been used in combination with the leaves of walnut (Juglans regia) as an external treatment for wounds, cuts, and scrapes. The herb is sometimes recommended as a remedy for hemorrhoids by adding the dried herb in a bath water or as an extraction in hot water as an eyewash for conjunctivitis. As an herbal infusion (tea): Add one or two teaspoonfuls of the dried herb to one cup of boiling water and allow it to soak for 15 minutes before straining. Three cups a day is often recommended for therapeutic benefits. As a tincture: 1 to 2 ml three times daily. Fumitory should only be used in small amounts. The herb has a toxic effect in large doses and can cause severe diarrhea, muscle cramps, and breathlessness. If the herb is intended for therapeutic reasons is advisable to do so under the care of a licensed herbalist or other health care provider knowledgeable about medicinal herbs. Until more research is carried out to document the herb’s safety, it is advised that children and pregnant or breastfeeding women do not use it.